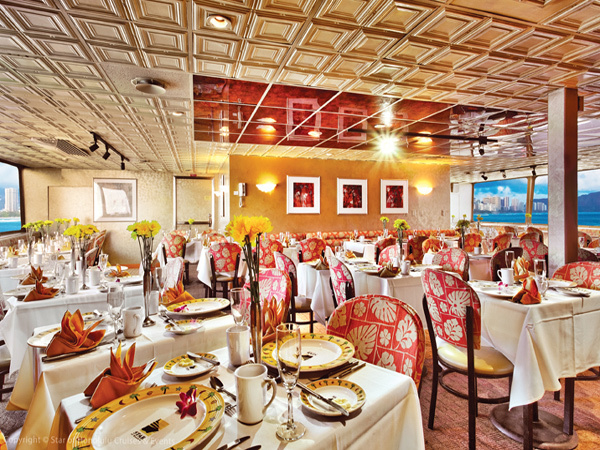 Join us on the Three Star Dinner Cruise on the Star of Honolulu. 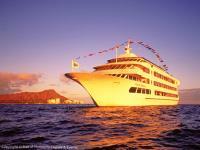 The Three Star Dinner Cruise elegant dining experience on the Star of Honolulu begins with fresh island flowers, hula dancers and a champagne greeting on this one of a kind Oahu Dinner Cruise. During your Oahu Sunset Dinner Cruise, you will enjoy fine foods on this five-course meal, which includes Maine Lobster, Filet Mignon dinner, and a delicious dessert, all accompanied by delicious cocktails. 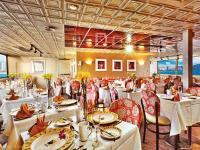 This Oahu Dinner Cruise offered by Paradise Cruises is a great Oahu Dinner Cruise for both couples and small families. 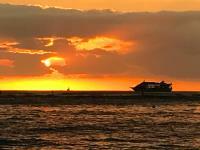 You'll also have an unparalleled view of of the Pacific ocean and a blazing Waikiki sunset. 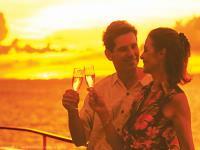 The evening is accented by entertainment, including our "Spirit of Aloha" show and the rhythms of a live band. 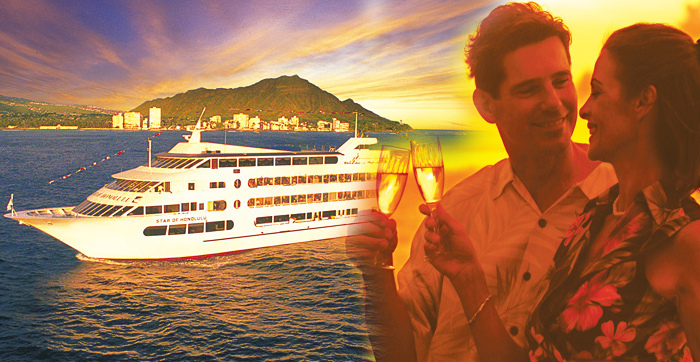 On this Oahu Dinner Cruise with Paradise Cruises, enjoy Hula dancers greet you as you board the luxurious Star of Honolulu. As you're seated, you'll enjoy tropical cocktail and beverage service. The festivities get under way as the Star of Honolulu quietly leaves its dock at Aloha Tower and heads out onto the placid Hawaiian waters near the Waikiki Coastline which is an eye’s view away from Diamond Head. 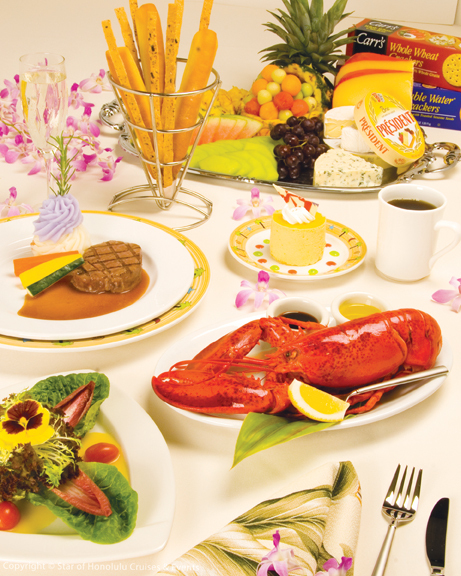 Your steak and lobster dinner is served at your table by a professional wait staff. 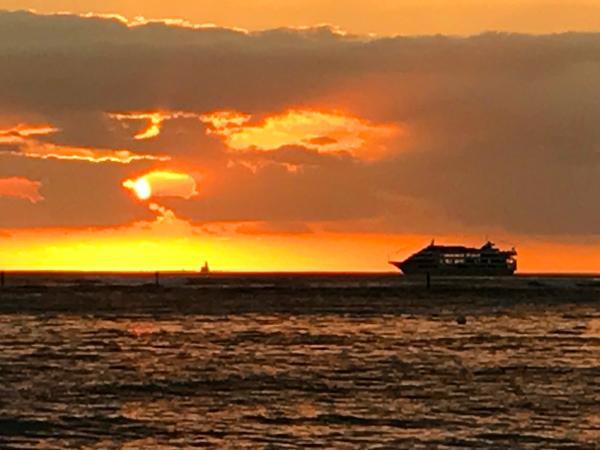 Take time to explore the ship's various decks, and don't forget to photograph the Waikiki sunset and all the lovely vista's you'll see from the observation deck of the Star of Honolulu. Next up is the "Spirit of Aloha" show, which you won't want to miss. Dancing Hula Dancer follows! 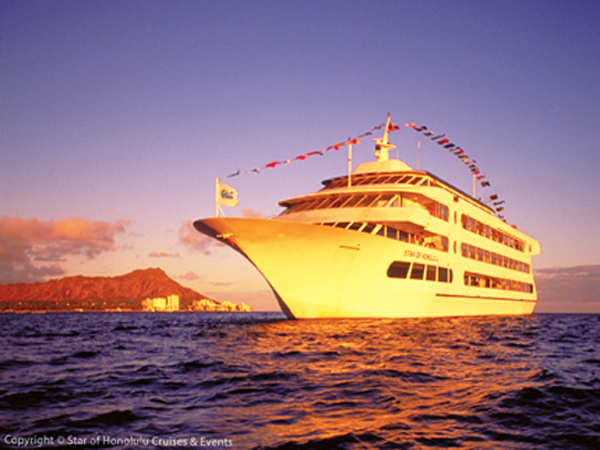 It's time to get ready to disembark the Three Star Honolulu Dinner Cruise. Reception Plan – Enjoy window seating (up to 8 persons), private table, photo (per person), lei cake and 1 bottle of champagne (per 2 persons). Minimum of 2 persons required to book. Price is per person.